Stickman Racer Jump is a sequel to the legendary game of survival, where you will have to make incredible tricks, driving different transport. The game is made in the best traditions of simulator games with ragdoll physics elements. Make incredible jumps and tricks and pitiless destroy your transport and the stickman! Your task is make the highest jump over the moon and make the finish alive or dead! Start the engine! Your bike is waiting! You will have to drive different vehicles playing for the stickman, again and again skipping along the shifting sands higher and higher skyward! You are not allowed to brake, drive fast! Jump as high as possible, break and destroy more transport to win! Once you skip a beat, you lose the game! 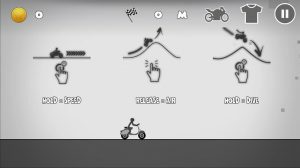 Stickman can ride a bike, a sport bike; scooter and even a quad bike! Each level includes new tricks! You can choose new types of transport! Win and use new transport! Do you want to feel the strongest one among stickmen all over the world? Will you survive in conditions of constant risk? Will you be able to react to bear the blow? Gather speed and jump into the space as a true Stickman! A lot of new locations and levels with different obstacles! New design, which stickman games funs will definitely like! All tricks are made by professional stickman – bump artists! Don’t try this in real life!